For centuries, the ancient city of Luts’k, a regional centre of Volhynia, has existed in the north-west of Ukraine. In this city you may notice intertwining of East and West cultures, Orthodox and Catholic religions, ancient and modern times, so don’t hesitate such opportunity to visit this city and convince yourself of this. Most architectural constructions of Luts’k are concentrated in its old part near the Styr River. The best place to start your acquaintance with the city is Kafedral’na Street. You can get there by minibus № 9 or 9-a, which routes follow Danyla Halyts’koho Street and pass Kafedral’na Street, to the left side of which Bridgettine Monastery can be noted by you. Now it is Orthodox St Archangel Monastery. In former times on the site of an old city, a huge fortification, Okol’nyi Castle, was located. Since the 15th century all buildings, including Bridgettine Monastery were used for defensive purposes. On Kafedral’na Street your attention will also be attracted by unique architecture of St Petro & Pavlo Cathedral, which was built in the beginning of the 17th century for Jesuits by architect Giacomo Briano. The building is decorated with sculptures, pilasters and paintings, which make St Petro & Pavlo Cathedral luxurious and pompous. The catholic cathedral is also known due to its underground burial vaults, where excavations have been carrying out till the present day. Following the street further you will notice three towers of a medieval fortress – Liubart Castle. It symbolises ancient Luts’k and is considered to be one of the best architectural monuments since the times of the Grand Duchy of Lithuania. 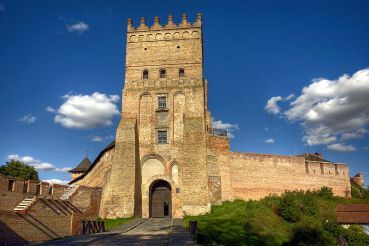 It is believed, if you climb one of three castle towers – Vyizdna, Vlastvena or Styrova – and look through all loopholes, it will bring you good luck. In addition, you are well advised to order an evening excursion around the castle. When it’s getting dark, torches are lighted, medieval music is heard and people in suits of armour appear. Liubart Castle hosts the annual Festival “Mech Luts’koho Zamka” (meaning Sword of Luts’k Castle), which welcomes its participants from all over the world. Many legends are associated with Liubart Castle. According to one of them, within its walls treasures are still hidden. Those to have found it should spend it only for the good of the city; otherwise they’ll never get happiness and prosperity. It is also a good sign is if you take a photo of Vyizdna Tower. They say it brings good luck. Following Kafedral’na Street go back to Drahomanova Street and further to a quay. Down the street, ruins of Okol’nyi Castle are located. In the 15th-16th centuries it occupied the territory of an old town and served as a defensive fortification from the south and west sides of Luts’k. 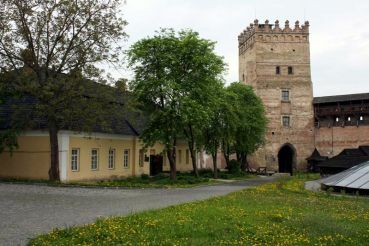 It consisted of Verkhniy Zamok (Upper Castle), better known as Liubart Castle, and Malyi Castle, presently Synagogue. After the period of six centuries, only fragments walls and one of eight towers have survived – Chartoryis’kykh Tower. 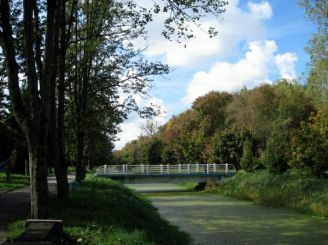 It has been named after the prince family, ruled in Volhynia in those times. You can climb Chartoryis’kykh Tower in order to see the Styr River, which flows around the old town. Next to the ruins of Okol’nyi castle, on Drahomanova Street, there is the house of the Kosaches. Larysa Kosach, better known as Lesia Ukrainka, used to live there before leaving her homeland. 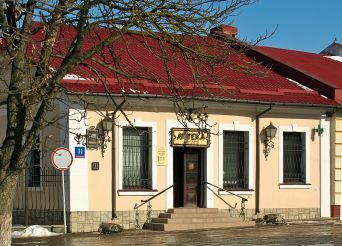 In the house № 23, on the first floor you can visit the small Museum“Lesyna Hostyna” of great Ukrainian poetess. In order to continue acquaintance with Luts’k you should go along Drahomanova Street to Troits’ka Street. At the crossing of Danyla Halyts’koho and Troits’ka Streets you’ll see the building of an original shape – Exaltation of the Holy Cross Church, which together with other buildings of the 17th century belonged to the city Exaltation of the Holy Cross Community. The church was financed by Volhynian merchants and Hal’shka Hulevychevna, a founder of the community. Great figures of the Exaltation of the Holy Cross Community are buried in the crypt of the church. Visit the church, where clandestine meetings of the Luts’k Community have been held. At the place, where Kafedral’na Street crosses Danyla Halyts’koho Street, Malyi Castle can be noted by you. This part of defensive fortification of Okol’nyi Castle is called Synagogue, which served as a religious institution of the city Jewish community initially. Later it was a defensive fortification, then – a public building and now trainings of school team “Yunyi Dynamovets” are carried out there. This building was built in the Renaissance style, where you may notice lack of striking decoration elements. However, Synagogue does not look like a Jewish religious structure. Kafedral’na Street will lead you to Karaims’ka Street, which you should follow down in order to get to Liuterans’ka Street. Lutheran Church and the Sculptor’s House are two buildings located there, which due to their unusual design differ from the general urban style. Lutheran Church has been built in the Gothic Revival style with a gabled roof and a towered belfry. Above the narthex you can note other slightly lower gabled roofs. It is a one-nave building with apses and choirs. Go inside Lutheran Church to enjoy its interior. Next to Lutheran Church you can find the house of modern sculptor Mykholai Holovan’, known among locals as “the house with chimeras”. It attracts attention of tourists from various cities and countries. Such interests to this building was caused by the fact, the sculptor turned his house and its yard into his studio, where various statues of fabulous characters and mythical creatures can be noticed by you. It is a great place to take striking photos and to listen to author’s stories about the times when his home brought together representatives of the Ukrainian creative elite. Summer is the best time of year to visit Volhynia. After visiting Luts’k you are well advised to have a rest in the urban village of Shats’k, an area of picturesque lakes. У Луцьку відбулася презентація аудіопутівника «Луцьк. 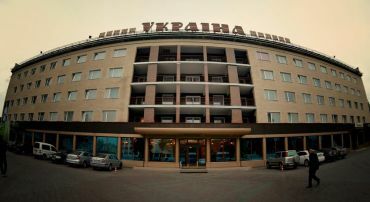 Прогулянки містом». Про це повідомляє прес-служба Луцької міської ради. Проект назвали «Луцьк у долонях», він допоможе познайомитися з містом туристам різного віку: від школярів до людей похилого віку. А також людям з порушеннями зору і з розладами читання (дислексією). This year in Lutsk erected a monument to Stepan Bandera. This decision took the executive committee of the town council. 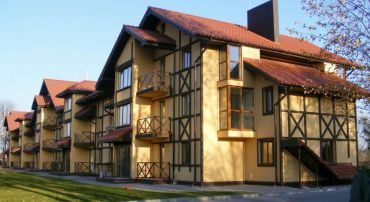 For the construction is planned to allocate UAH 200 thousand.